sharing a common faith | doberman pizza. One of the fundamental principles revealed by Bahá’u’lláh is that of the oneness of religion: The idea that all the world’s great religions are, in fact, one religion that has been revealed progressively over time by different Manifestations of one and the same God. The fact that the messages they taught seem to differ is not because they came from different Gods, but because they were revealed at different times to peoples with different experiences and capacities. That said, other differences have appeared between the great religions we see today: Differences that arise from the additions—and even alterations—that human beings have made to the essential spiritual messages they were given. Re-interpretations of Scripture made by religious scholars and clergy, blind imitation of the past, superstitions arising from ignorance and misunderstanding… all of these have compounded the differences that now exist between the world’s religions. For the nation of Vietnam, the differences between Buddhists and Catholics deepened a chasm that the Cold War had opened. And who ended up being there to try and bridge the divide? The Bahá’ís. From its earliest days, the Vietnamese Bahá’í community championed the cause of inter-religious harmony. World Religion Day, spearheaded by the Bahá’ís and observed in Vietnam every year between 1962 and 1975, gathered representatives of many different religions to deliberate on weighty themes: “Mankind must, and are able to achieve religious unity”; “Religion must be the cause for unity of mankind”; “The purpose of religion is to establish unity and harmony”; and so on. Government should “foster Religious Harmony by encouraging the peoples and religious leaders and proclaim one day of the year World Religion Day and declare it a public holiday dedicated to the goal of Religious Unity on which day the followers of every faith may visit each others pagodas, churches, temples to pray to the Divinity of all the Prophets”. 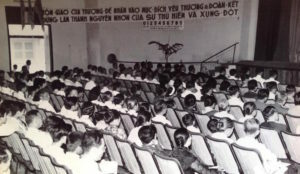 This audacious appeal, which struck at the core of religious prejudice, must have been dismissed by many as being too fanciful or unrealistic—after all, it called on “the Venerable leaders of Buddhism in Viet Nam” to “publicly proclaim that they Believe that Lord Christ is endowed with the same Divinity and Spirituality as Lord Buddha and identical with Him”, and on Christian leaders to “proclaim likewise that the Lord Buddha is in every way equal and identical to the Lord Christ in His Spiritual and Divine Glory”. What kind of self-respecting clergyman would agree to eat humble pie in such a dramatic fashion? But to the Bahá’ís, these acts were necessary to achieve true unity and prevent nationwide calamity: “Only then can we make the Buddhists and Christians of our sad nation rush into each others’ arms and eliminate any maneuvers to direct them instead at each others’ throats.” Moreover, the Bahá’í appeal was consistent with the belief that all religions are, in fact, reflections of the same message from one and the same God, revealed progressively throughout the evolution of mankind—that all human beings, whether or not they realize it, are in fact following many different representations of one common faith, which is “the changeless Faith of God, eternal in the past, eternal in the future“. The original post, world religion day in vietnam, is one of the most popular posts on doberman pizza. With files from Mr. Jamshed Fozdar and Wikipedia. Photos courtesy of Mr. Le Loc. This entry was posted in asia chronicles, baha'i blog and tagged bahaiblogging, interfaith, religion, vietnam by danger. Bookmark the permalink. But even though the Council fell far short of the goals set by the Bahá’ís, that doesn’t mean inter-religious dialogue stopped. 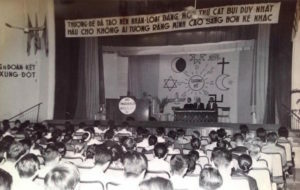 World Religion Day was still celebrated every year in more and more centres throughout Vietnam, involving more and more influential figures. The Bahá’ís there still celebrate it every year, as well as World Interfaith Harmony Week, which continues to draw representatives from many of Vietnam’s religious communities.